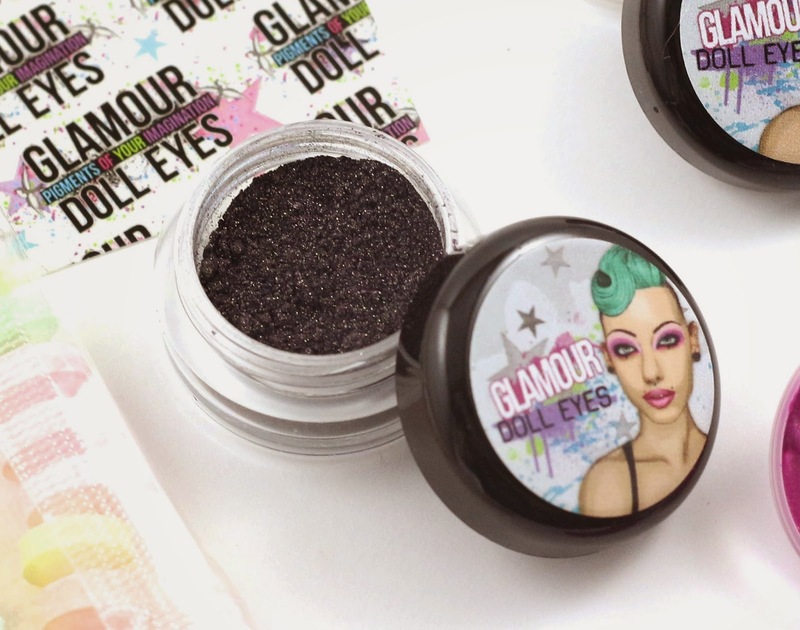 Glamour Doll Eyes is an Indie pigment company that offers all kinds of beautiful shades of eye, lip, and cheek pigments. 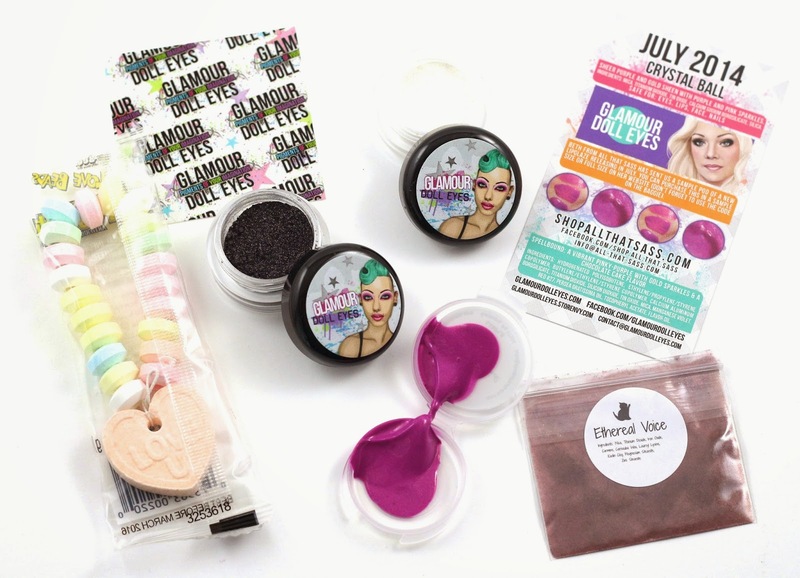 They also offer a monthly subscription service, called OTM, or "Of The Month" that includes a limited shadow that's only offered in the OTM. It also includes some extras, usually candy and a few other goodies! I'll include some more details on this at the bottom of this post if you're interested in signing up. 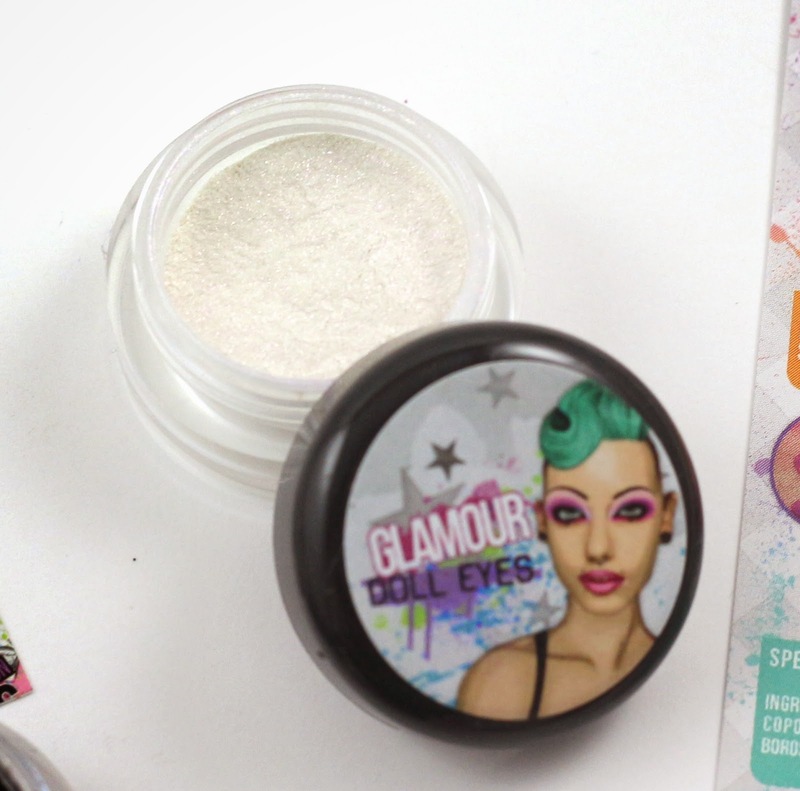 The Glamour Doll Eyes OTM is shipped via USPS, and it arrived in 2 days from Nevada to California. This month there were a ton of products! 3 shadows and a lip glaze! Plus the bonus candy was a candy bracelet. I already ate it. It was full of sugary delicious! Crystal Ball - Sheer purple and gold sheen with purple and pink sparkles; it's hard to tell in a photo, but this isn't really a white eyeshadow. It's like pink iridescent. Could be a good highlight color, or inner eye corner highlight. This color was from a mother-daughter team, this one being Sheryl's, the mother's color. Spellbound - (Kiss My Sass) Vibrant pinky-purple with gold sparkles and a chocolate cake flavor; This is an extra from the All That Sass company, their new lip glaze formula. It's a beautiful color, tastes delicious, moisturizing, not drying, long lasting, everything you could want from a product like this. I love it. I may order more from them! Swatch photo below. Under the Moon - (Extra #1) Matte black base with a purple sheen and goldish green sparkle; Crystal Ball and this color were from a mother-daughter team, this one from Raven, the daughter. I don't know how to feel about this color, I don't do smoky eye too much, and I don't know how I'd use it for a day look. I'll have to try to come up with something. 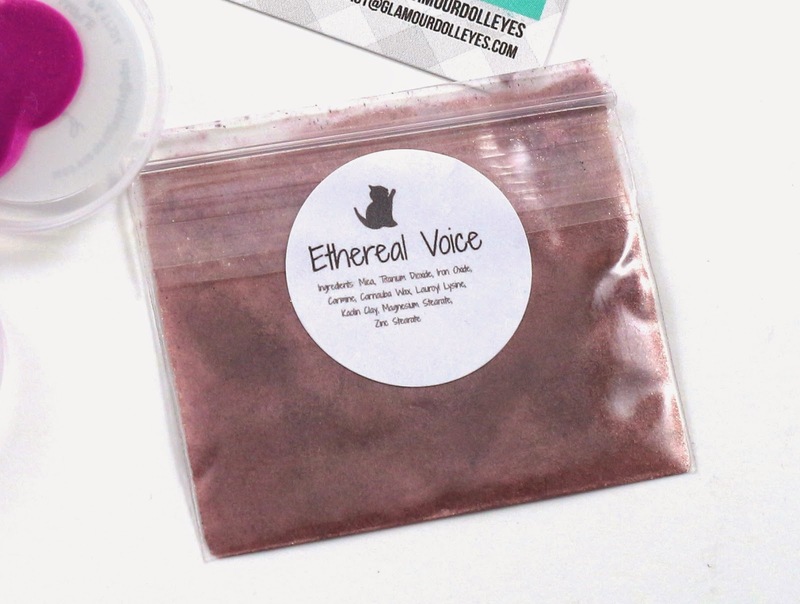 Ethereal Voice - (Extra #2 from Hello Waffle Cosmetics) Warm purple with golden shimmer; This color is totally my style, I love pinks and purples! I've been eyeing this company for a while, and I've been thinking about making an order, but just haven't yet for whatever reason. 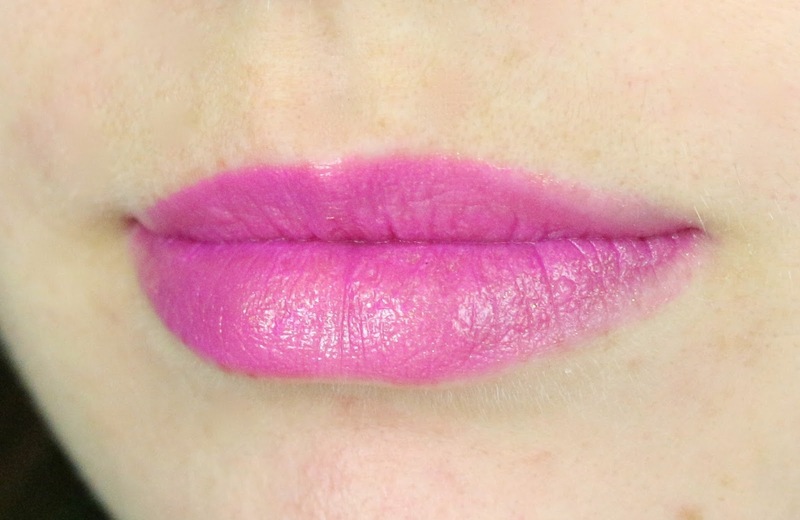 Spellbound lip glaze swatch - I absolutely love this color, it's a little darker in person. 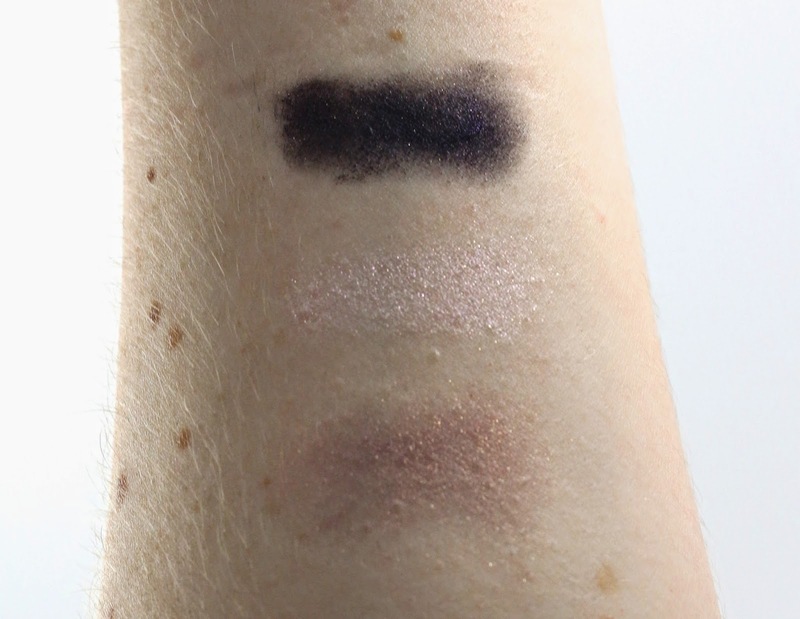 I wore it around the house after I did this swatch and it lasted all night almost, and even in the morning there was still a slight stain on my lips. I don't mind when lip products do that, because it usually means they tend to last longer, and don't need to be reapplied as often. Definitely recommend this product and especially this color. I've already taken a look at some of All That Sass' other colors, and I can't wait to buy some more! Swatches - Under the Moon, Crystal Ball, and Ethereal Voice. Sorry the swatches are so light I was too lazy to go grab my primer. But they are all very lovely, and I can't wait to get a chance to try them. Overall, this month was a great OTM, I found new products I love! And that's always a good thing, right? And I'm glad I got a chance to try something from Hello Waffle as I've been wanting to purchase some of their products for a while. 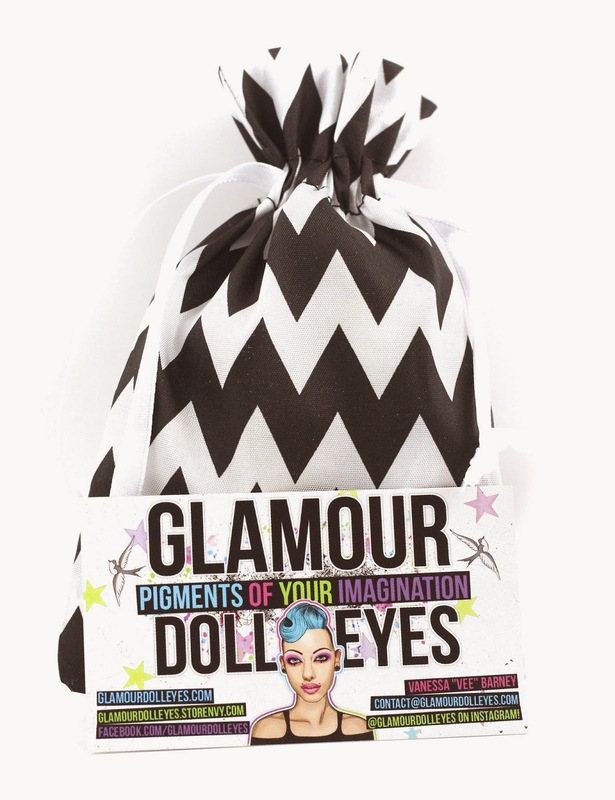 The Glamour Doll Eyes OTM is a limited subscription you have to act fast if you want in! Every month on the 8th (or the Friday before if the 8th falls on a weekend) they offer up 1, 2, 3, 6, or 12 month subscriptions to sign up for. The price will depend on which subscription you sign up for, but my 3-month was $21, or $7/month.